FREE GIFTS WITH ORDERS exclusive to some items. 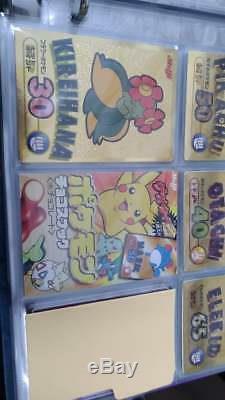 POKEMON COMPLETE GOLD MEIJI PROMO CARD SET 1998 JAPANESE JAPAN RARE OLD HTF LOT. WHAT IS PHOTOGRAPHED - IS EXACTLY WHAT YOU RECEIVE. POKEMON COMPLETE GOLD MEIJI PROMO CARD SET 1998 JAPANESE JAPAN RARE OLD HTF. 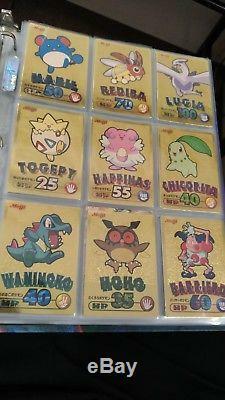 All 16/16 cards gold coloured Pokemon Meiji promo chocolate cards from 1998 included here today. Priced to clear super fast. EXTREMELY HARD TO FIND THESE GEM MINT-MINT LIKE THIS! Just the 16 card set will be included only. This was a promotion by Meiji the chocolate / candy company timed i think just after the mewtwo pokemon movie. There is about 3 variants like this, gold, silver, and blue platinum. This is for the gold set, which is probably the nicest and most desirable. CONDITION - GEM MINT - MINT CONDITION. Please read below for full breakdown of my condition format. A mint condition card is an amazing almost pack fresh pulled card, but may be off center slightly, have 1-6 mm's of faint white edge wear, around corners or the sides of a card. It may also contain hairline scratches which are usually machine induced from wizards of the coast or Nintendo themselves. A mint card is always border-lying gem mint-mint, and can swing either way when being grading. Near MINT 8.4-6.5/10. A near mint card or game is still an immensely exceptional item. It is almost perfect, but must contain a minor flaw which is stopping it from being a high gem mint piece. Near mint cards usually may have one of the following: between 1-12mm's of back edge wear, feathered surface scratches, light playbility, may contain minor light saturation, inking, minor bends, or tears. Still an awesome condition card, these will look flawless in a binder sleeved, and you will not be able to see the flaws from afar. These cards will have 2 or more of the following flaws: between 1-32mm's of back edge wear, surface scratches, light playbility, may contain minor light saturation, inking, minor bends, tears, marks, scuffs. As the word suggested, this is heavily played in a school yard, or treated badly by children. It would contain immense edge wear, massive bends, massive tears, massive flaws like light saturation, inking, spills, stains, marks, scuffs. The list goes on, if it has 3-4 of the major flaws i mention above it usually falls into played condition. Estimated time of arrival depends on the location, generally 2-3 weeks for international buyers. What is the average turn around time for deliveries? You have the option for EMS express which is 2-6 days on average. E IF YOU CHANGE YOUR MIND, OR FIND THE ITEM CHEAPER ELSEWHERE, YOU WILL NOT BE COVERED. Please refer to the individual photographs of all listings, and the condition description range. Will my item be wrapped well? Everything is greatly wrapped in multiple layers of bubble wrap, cards with secure toploaders, new sleeves, cardboard when necessary, and we use cotton based synthetic gloves for high end items. PLEASE NOTE, THIS LISTING IS FOR ALL 8 x duo card sets, all that is photographed, you will receive. Every single card shown, you win. The item "POKEMON COMPLETE GOLD MEIJI PROMO CARD SET 1998 JAPANESE JAPAN RARE OLD HTF LOT" is in sale since Monday, July 9, 2018. This item is in the category "Toys & Hobbies\Collectible Card Games\Pokémon Trading Card Game\Pokémon Individual Cards". The seller is "japan-international-trade" and is located in Omiya. This item can be shipped worldwide.